Surrounded by U.S. 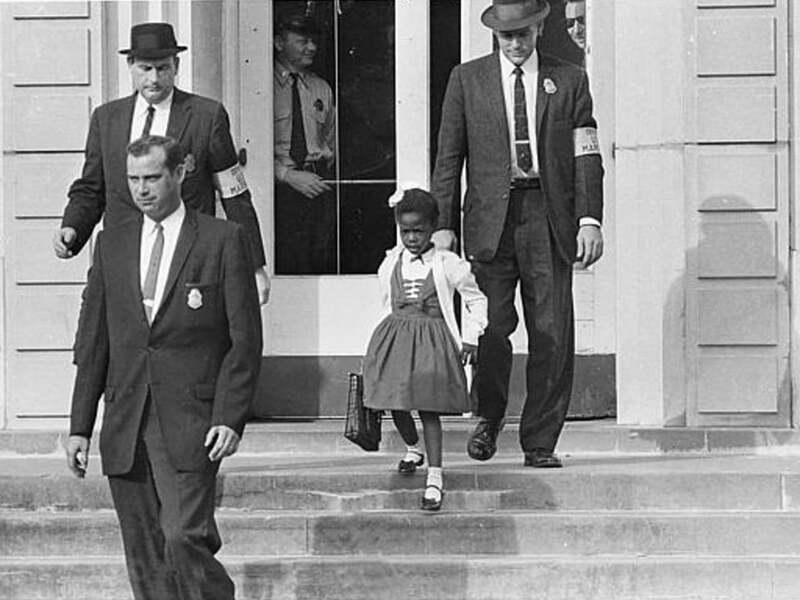 Marshals, six-year-old Ruby Bridges makes her way down the steps of the William Frantz Elementary building, finishing her first day of classes and becoming the first African-American to attend a white elementary school in the South. The moment is immortalized in this black and white photo taken by a Department of Justice employee. From fierce determination to tender approval, the iconic image simultaneously captures the vivid range of emotions spanning subjects of different age, gender and race. Ruby Bridges escorted by three U.S. Marshals from William Frantz Elementary School in New Orleans, 1960. “The morning of November 14 federal marshals drove my mother and me the five blocks to William Frantz. In the car one of the men explained that when we arrived at the school two marshals would walk in front of us an two behind, so we’d be protected on both sides. Sure enough, people shouted and shook their fist when we got out of the car, but to me it wasn’t any noisier than Mardi Gras, I held my mother’s hand and followed the marshals through the crowd, up the steps into the school. We spent that whole day sitting in the principal’s office. Through the window, I saw white parents pointing at us and yelling, then rushing their children out of the school. In the uproar I never got to my classroom. The marshals drove my mother and me to school again the next day. I tried not to pay attention to the mob. Someone had a black doll in a coffin, and that scared me more than the nasty things people screamed at us. A young white woman met us inside the building. She smiled at me. “Good morning, Ruby Nell,” she said, just like Mama except with what I later learned was a Boston accent. “Welcome, I’m your new teacher, Mrs. Henry.” She seemed nice, but I wasn’t sure how to feel about her. I’d never been taught by a white teacher before. Mrs. Henry took my mother and me to her second-floor classroom. All the desk were empty and she asked me to choose a seat. I picked one up front, and Mrs. Henry started teaching me the letters of the alphabet. Even though I was only six, I knew what she meant. The people I passed every morning as I walked up the schools steps were full of hate. They were white, but so was my teacher, who couldn’t have been more different from them. She was one of the most loving people I had ever known. The greatest lesson I learned that year in Mrs. Henry’s class was the lesson Dr. Martin Luther King Jr., tried to teach us all. Never judge people by the color of their skin. God makes each of us unique in ways that go much deeper. From her window, Mrs. Henry always watched me walk into school. One morning when I got to our classroom, she said she’d been surprised to see me talk to the mob. “I saw your lips moving,” she said, “but I couldn’t make out what you were saying to those people.” “I wasn’t talking to them,” I told her. “I was praying for them.” Usually I prayed in the car on the way to school, but that day I’d forgotten until I was in the crowd. Please be with me, I’d asked God, and be with those people too. Forgive them because they don’t know what they’re doing. The abuse wasn’t limited to only Ruby Bridges; her family suffered as well. Her father lost his job at the filling station, and her grandparents were sent off the land they had sharecropped for over 25 years. The grocery store where the family shopped banned them from entering. However many others in the community, both black and white, began to show support in a variety of ways. Gradually, many families began to send their children back to the school and the protests and civil disturbances seemed to subside as the year went on. A neighbor provided Ruby’s father with a job, while others volunteered to babysit the four children, watch the house as protectors, and walk behind the federal marshals on the trips to school.